I'm digging through my archives today because the truth is, we are still living in a hotel. The only opportunities I've really had to cook are at my parent's house. Hopefully we will be back home by the weekend. I'm anxious to begin cooking again - I've missed it! This recipe is so simple and so delicious! I love them for showers or holidays or pitch-ins. You can easily modify this recipe by omiting the lemon zest and adding mini chocolate chips or by using lime or orange zest, or whatever else sounds good! They are wonderful and quick for unexpected company or weekend treats. Preheat oven to 350 degrees F. Line miniature muffin tins with miniature paper liners. Place 1/2 teaspoon of the crushed vanilla wafers into each paper cup. Bake for 15 minutes. Cool. Top with fruit just before serving. Garnish with whip cream if desired. 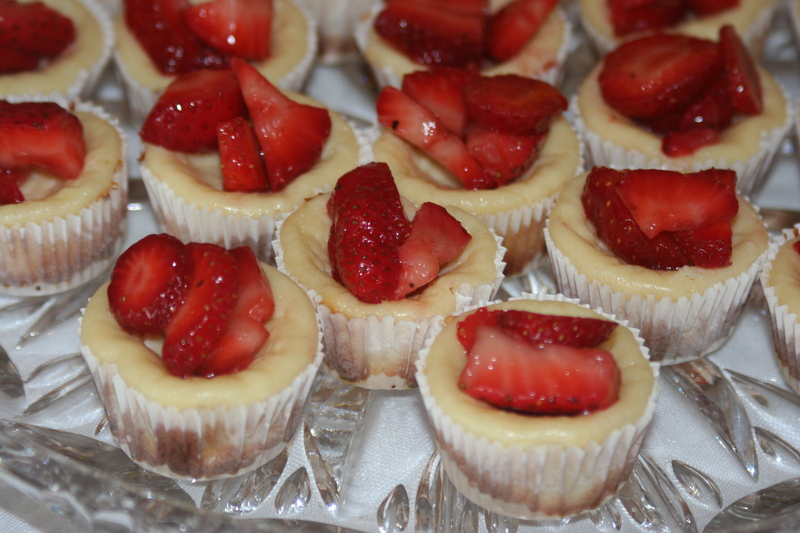 Makes about 48 miniature cheesecakes. I have two packages of cream cheese that are about to expire, so I'm planning to make these this weekend. Perfect, thanks! We used to make these for our bake sales at school. We did not crush the wafers we just put one in the bottom of the liner. They fit just right. You can use any cookie that is about that size. It just eliminates one step and part of the mess. Yep, it was really that bad. It's been a month since it happened. We move home this weekend. Unfortunately when you have a protein fire like we did, it coats everything. We would get headaches and sore throats just from being in the house for less than an hour. Thankfully it is all cleaned now!